To DOKKEN or not to DOKKEN… In the wake of what surely will be the last (Don) DOKKEN album, remaining originals George Lynch, guitars, Jeff Pilson, bass, and “Wild” Mick Brown (doubling in both versions) do a version of their own, scantily clad as T&N (“Tooth and Nail” as you have already gathered). On the vocal front many apparently wanted in as they are joined by Tim “Ripper” Owens, Doug Pinnick, Sebastian Bach, and Robert Mason (WARRANT). The drumming is for some reason augmented by WHITESNAKE and FOREIGNER hot shot Brian Tichy. Is this a temporary cash in, an act of defiance or a true return to form? Opener “Slave to the Empire” sure reminds me of the opener “Empire” on the latest DOKKEN effort. It´s somewhat pompous and grand, the pace is higher and the song is a display of classic hard rock. The song is a nice enough start but on the subject of openers it´s a draw. I could patch together the likes of “Sweet Unknown”, “Rhythm of the Soul” and “Mind Control” and say that they are interchangeable between the competing albums, that would imply 4-4 after just about half an album of material. But then T&N cheat, using no less than five classics in slightly new versions. 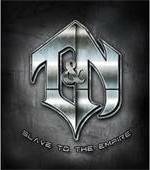 And as Don´s vocal chords are in a bad shape I have to say that with the exception of the slightly less classic “Alone Again” this trick leaves T&N in the lead by 8-4 since the DOKKEN album is short of classics. DOKKEN on the other hand has the new additions “Tonight” and “For the Last Time”, while T&N only boasts the rather good “When Eagles Dare” and “Mind Control”. In all fairness this would mean something like a T&N victory by 9-6 or thereabouts. But in all fairness, the best solution would be a full-blown DOKKEN reunion…but alas, that seems highly unlikely.